Albany does drizzle well. It’s no surprise really that Frederickstown, as it was originally called, was the first English settlement in WA – the climate reminds me a lot of England. The landscape too, I love all the greenery, and I guess they go hand in hand. Last time I came to Albany, over Christmas 2007, I spent hours wondering the house and gardens at The National Trust’s Strawberry Hill property (the first farm in WA I think?) – which is a little bit of England carved out of a now fairly ordinary surrounding urban landscape. Captivating for someone who made a habit of visiting National Trust properties whilst living in England. This visit? It was drizzling when I decided I needed a walk just after setting up at the caravan park late last Thursday afternoon. So I wondered along Albany Highway towards the city centre. If I had been more switched on, I’d have realised that was an ill-advised move. On arriving at the main shopping centre, on late night shopping night, very damp and having spent the previous month or so in much smaller communities, I decided I really didn’t want to stay in Albany and work, as I had intended. That night this city struck me as being not so different to Geraldton – same bogans, same number or worse of cars and people and shops, but with better scenery and worse weather! and I didn’t really feel I was likely to get the completely different experience I was craving if I stayed and lived and worked here for a while. In the intervening week, my opinion of Albany has improved considerably – getting about the town centre on my bicycle for the first two days was very enjoyable, and then having a good drive about for the next couple of days even more so. But the decision remains. After doing some mental maths, researching job opportunities for travellers and giving myself a stern talking to about the need to set a strict budget and stick to it, admittedly still a WIP (work in progress!) I realised I can safely continue my journey without too much fear of ending up destitute and unable to find a job. So, the highlights of my stay in Albany? Torndirrup National Park – just stunning. I skipped whale world, the natural bridge and gap, I’d been there before. But I checked out Salmon Holes beach – gorgeous, and I skipped down from the lookout via the maybe 100m of steps, to walk the length of the small cove in my bare feet and then climb back up the stairs at the other end. Then I took a hurried trip to the Blowholes. When I arrived there, quite a few cars were parked up with all their occupants clearly having made the 2km round trip by foot down to the site. Buoyed by my Salmon Holes experience, and energised by the stormy weather (and the sight of a impending storm rolling across the sea) I skipped/jogged my way down the path. The first couple I came across warned me I wouldn’t be so energetic coming back up! By the time I was 2/3 of the way down I understood what they mean – that was some downhill! It turns out the hole wasn’t blowing any water anyway, the conditions weren’t right. It was worth it though for some awesome cracking sounds (made me jump!) and wind blowing through the hole, and the excitement of racing the storm back to the car park (and I did run up half the way – fortunately I had the storm at my back helping me along). I got back to Sweetie just in time. 1849 Backpackers – I am amazed at the number of caravan parks in Albany, and the complete lack of competitive pricing between them. I struggled to find a powered site for less than $30 a night, whereas in Denmark I was only paying $20. So I decided to check into a backpackers after my first few nights as it was the same price anyway and I figured it would be nice to sleep in a normal bed for a few nights. I also needed to empty out half my van so I could go and get my 12volt battery and lights checked out by a local business. As it turns out, I actually haven’t slept so well in the backpackers after all, and actually feel guilty for leaving Sweetie out in the cold and rain on her own! But the staff and small group of regulars at 1849 are so incredibly welcoming and friendly and have really looked out for me – its been a lovely place to spend a few days with an adopted “family”. Plus they have baths – good old fashioned deep long baths. Heaven! Historic buildings – I visited Patrick Taylor Cottage, the oldest residential dwelling in WA, which was fascinating. I marvelled at all the wonderful old buildings that have been retained and reinvigorated, all with such a strong English feel to them. 1849 Backpackers is in the top floor of the old London Hotel – est 1849 of course! – and you can feel the history in the place, despite the number of different lives it’s had since then. My favourite part is the downstairs “dungeon” – what would have originally been an open courtyard at the rear of the hotel, but is now covered over, with plans by the backpacker owner to use the commercial kitchen adjacent to reinvent the space as a Mediterranean courtyard cafe. So much potential! The downstairs front part of the building is Liberte cafe wine bar – a European styled venue serving fantastic coffee (my room is right above the cafe – taunted all day long by the smell of coffee) and cakes and drinks – converting into a late night bar venue on Friday and Saturday nights. The old ball room has been converted into an eclectic casual sitting space with a huge range of vintage chairs, sofas, coffee tables etc arranged around the open fire. Really special and unique. Albany’s new foreshore development – including the Albany Entertainment Centre and ANZAC Peace Park – recently completed and sitting proudly on the waterfront between the city centre and water. AEC is a stunning and unique architectural creation. They run a series of Thursday night concerts in the harbour side foyer, taking advantage of the spectacular location of the adjacent cafe / wine bar, featuring one out of town guest artist each week backed up by local talent, as far as I can tell. I won’t get to experience any of them unfortunately – Andrew Winton is in town tomorrow night, who I’d love to see again, but it sold out months ago! But from having visited the venue and checked out the site and the series programme, I bet it’s a beautiful way to spend a Thursday night. ANZAC Peace Park is a really thoughtfully designed and interpreted space, focused on the sudden appearance of two large convoys of Aus/NZ warships that docked in Albany in late 1914 for re-stocking and marching practise prior to heading off to WWI. Happy hour at Tanglewood Brewery / White Star Hotel – $6 pints of local brewed beer every day from 5:30-6:30pm. Yum. And dangerous! I went and settled in on Sunday eve to enjoy the live music by Crossbow – a unique band formed of double bass, guitar, and two fiddles (one of who occasionally switched to guitar also). Lots of Irish/Scottish jigs and the like of course, but also Jewish songs, inventive pop/rock covers and just generally good craic! A real joy to experience. The lady fiddler held her instrument as though it was a cello – fascinating! Today, the sun was shining down on Albany and the sky was bright and blue, reflecting magnificently in Princess Harbour. What an awesome finish to my stay. Tomorrow, I head north to Porongurup National Park and then on to the Stirling Ranges – time to test my head for heights again! 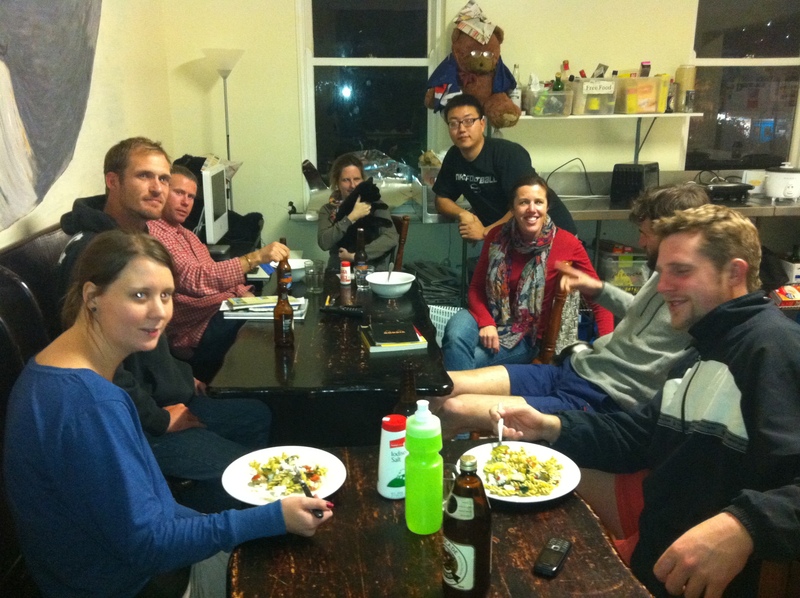 This entry was posted in Uncategorized and tagged 1849 Backpackers, Albany, Albany Wind Farm, Torndirrup NP. Bookmark the permalink. Loving hearing your stories and escapades, the $6 pints sound delicious even though rated as dangerous and the AEC and ANZAC park sound amazing. Keep both hands on Sweetie’s wheel and look out for long, deep baths – very distractin for that mental maths issue spoken of earlier. So – has my crossing the border to SA yesterday closed the “book” you guys were running?